Yalong Bay (Asian Dragon Bay), Yalong Bay Travel, Yalong Bay Pictures, Sanya, Hainan Island, China. Yalong Bay, also known as Asian Dragon Bay, sits roughly on the same latitude as Hawaii and enjoys similar temperatures and weather conditions. It is farther from Sanya downtown than Dadonghai beach and has been developed into an international holiday center with multiple 5 star resorts, golf courts etc. Eight Kilometers (about five miles) of white sand stretches along the crystal water, backed by palm trees and lush green hills. The water here is wonderfully clear, reflecting the blue sky. Beach chairs in Yalong Bay. A yatch on the crystal water in Yalong Bay. Regarded as the best beach in Hainan Province, many internationally-operated hotels have been built at Yalong Bay, including the Gloria Resort (the first five star resort in China), Sheraton Sanya Resort, Marriott Hotel, The Ritz-Carlton Resort, and Holiday Inn Resorts. Several domestically-operated hotels including Resort Horizon, Mangrove Tree Hotel, and Cactus Resort have also been built. 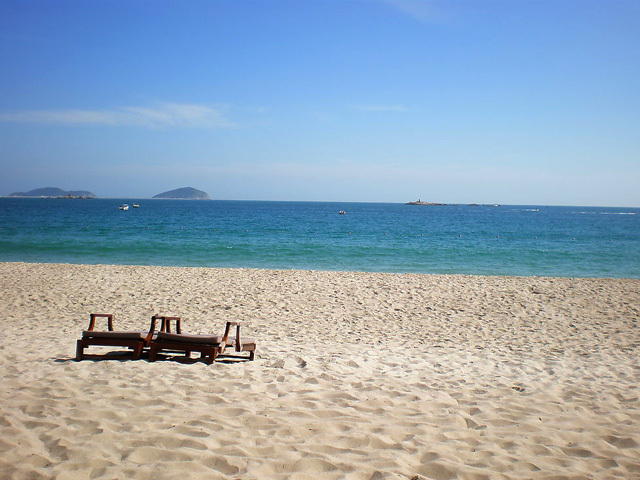 Each hotel has its private beach which only allow the guests whom stay in their hotel. This is arguably the nicest place to dive on the entire island, with its crystal water, and bright-colored coral reefs as well as tropical fish abound. This is a new resort and development is underway in a very tasteful manner. This is a protected marine reserve and commercial fishing is forbidden here, keeping the water very clean and lovely for swimming. Facilities are also good here. This great beach is adjacent to shops, restaurants and a museum with a pretty collection of seashells. There is also a charming outdoor butterfly valley located at north of the Yalong Bay where here with a mountain hiking trail and some great walks. In the centre of Yalong Bay square stands a 27-meter-tall Totem Pole, on which the God of Sun, and Gods of Wind, Rain, and Thunder as well as those legendary animals such as Dragon, Phoenix, Kylin and Fish are engraved. The design of this square symbolizes the Chinese 5,000 years' civilization and has received recognition in winning the Luban Prize - awarded to the top level design of architecture in China. 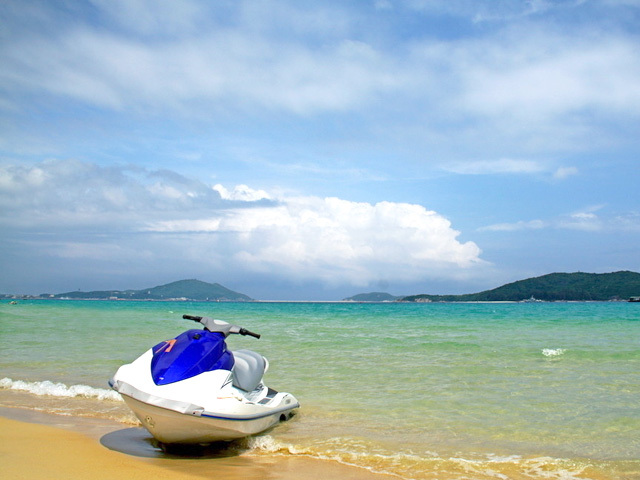 How to get Yalong Bay: The bay is about 20-25 km southeast of Sanya City. One can take a taxi from the downtown to get there and the cost should be approximately 50 RMB.